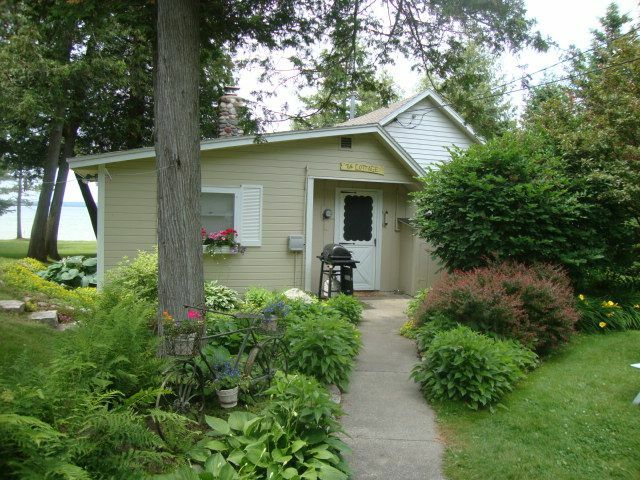 This beautiful, well maintained cottage is located in a secluded area on the East side of Mullett Lake. Enjoy breathtaking sunsets and swim in the turquoise waters or sit on the dock and enjoy the quiet, serene beauty of Mullett Lake. The cottage has two bedrooms, one with a queen bed, the other with two twin beds. There is a loft with a half bath above the detached garage with a queen and full bed, sofa, chair and T.V. The fully-equipped kitchen, spacious living room, and dining room all have views of Mullett Lake and all newly renovated. There is a dock for your use as well as a firepit by the lake to enjoy the wonderful, peaceful evenings as you watch the sunsets. Bring your own boat, launch at nearby Aloha State Park, or rent one from a nearby marina to enjoy Mullett Lake and the Famous Inland Waterway. * Bring your own linens and towels. * Please be considerate and keep cottage neat and clean for the next vacationers. * Check-In is 3:00 P.M. and Check-Out is 11:00 A.M.
* Weekly rental is Saturday to Saturday and weekend is Friday to Sunday. * There is NO SMOKING and No Pets. Beautiful clear blue water with nice lake bottom, no weeds or muck, great swimming! It was a very nice, clean home on a beautiful lake! The bonus room and bathroom above the garage made it perfect. Nice private yard and close to the park for walks and volleyball. The cottage and loft were very nicely updated and decorated. Both were very comfortable and well maintained. The cottage had a great view of the lake. The beach was not sandy, but instead had pebbles, small stones and shells, that our grandson loved. The water was clear and pleasant to swim in with a very gradual drop off. A well cared for lot with shade trees on either side made a nice place to sit and view the lake. The cottage is only about a half-hour drive to the bridge and ferry to Mackinac Island; a great side trip! We thoroughly enjoyed our stay! This cottage is the perfect getaway retreat. Situated on Mullet Lake on the outskirts of Cheboygan, MI and within walking distance of Aloha State Park, it is at the end of a long private road with 4 or 5 other homes. The cottage has been beautifully updated, including the loft area above the garage. The kitchen is fully equipped with all the equipment you need to cook dinners. The walls of the master bedroom don't go all the way to the ceiling so just be aware that if you have children with you, there won't be complete privacy. The guest bedroom has two twin beds. WiFi is available and cable TV though you'll be too busy enjoying the view to care about staring at your phone or the TV. There is a fire pit in the backyard for making s'mores. There is a narrow dock and the backyard is large and flat and shady from the trees. The shore is rocky so you'll need water shoes if you plan to go in the water. The owner is very helpful and friendly and responsive. We had no issues while we were there, the neighbor even came over and introduced himself and let us know we could alert him if we had any problems or questions. You do need to bring your own bed sheets and towels, which I usually do whenever we rent a place anyway. There is no washer & dryer in the cottage so pack enough clothes for your stay. There is a rails to trails path very close to the cottage where you can bike or hike. We saw several deer while walking on this path. We would definitely rent this cottage again. Exactly as advertised. In a quiet, wooded area on lake with beautiful view. Kids had a great time playing on beach and in water. Cottage updated and cozy. Owners made everything easy and quickly responded to all questions. We would definitely stay here again. Beautiful Home in great location !! Last minute get away with 6 adults and we were able to stay at this lovely home. Having the Loft above the garage was ideal. Location just north of Aloha State park was great for launching our boat. We enjoyed the Bike/ Walking path that took us to the State Park. Neighbors were friendly and helpful. Beach was a little rocky but it didn't stop us from enjoying it. Would definitely stay here again! !